Even though the breakup rates among anime couples are notoriously high, like a Disney fairytale, we still expect that once our couples have overcome adversity, they will settle down and live a happily-ever-after marriage. But life isn’t always so easy (see Clannad’s possible future and Suzuka as examples). For many years, it’s been quoted that around 50% of marriages in America end in divorce. And although this statistic may be a little off, the emphasis remains true: marriage isn’t always, or even often, successful. In Japan, the rate is better, but is still at about 27%, and doubled in the last quarter of the 20th century. Naru and Keitaro have overcome every obstacle…or so they thought. What they didn’t realize is that “finding your meant to be,” “getting into college,” and “overcoming Keitaro’s (possible) perversion” aren’t really huge obstacles at all. Keitaro continues to be away from home on excavations, and Naru becomes depressed…and then angry. Post-partem hits her hard when the first child, Ura Urashima, comes, and Naru’s pent-up rage continues to develop as she serves as the primary caregiver. Eventually, it all boils over when Keitaro visits his wife and child, only to let them know he’s on his way to another turtle dig. Naru lets go and punches Keitaro halfway to China, but the commotion leads the authorities to their house, and poor Ura is taken away. Naru is ashamed, and under the stress of domestic violence and the loss of their child to protective services, the relationship crumbles. Kyousuke’s bumbling ways continue to annoy Madoka from time to time, but her personality continues to thaw. She grows more loving, especially now that she can guiltlessly love Kyousuke. The two marry, as Hikaru overcomes her heartbreak and serves as maid of honor. Madoka reopens ABCB as her own establishment and Kyousuke uses his esper powers to actually help people. They feel a sense of fulfillment from the things they do…but something is still missing. Eventually, the two welcome their first package of joy…and boy, is little Hikaru a handful, learning from the time she could crawl to use “The Power,” often swapping bodies with her daddy. However, she brings untold happiness to the household, and the family adds two more children, as Kyousuke and Madoka, despite her business floundering, find joy in their family. Taiga…remains Taiga. She never fully gets rid of the tsun part of her personality, and when she gets nervous or frightened, still takes it out on poor Ryuji. But his love masks her wounds and shortcomings, and she also becomes more loving. They officially marry after high school. But life is hard on the poor couple. Taiga works odd jobs (often getting fired for her…anger management problems) and Kyousuke must take a job as a janitor. Financial problems arise, but they work hard and despite being on the edge of divorce a number of times, continue to remember that love conquers all. Eventually, Kyousuke works his way up to “Chief Janitor of Japan” and Taiga is able to hold down a job as an undersized model; she also finds happiness in a most unexpected place – as a mother. Life is hard…but good. Tomoya cherishes what he feels is a second chance, and surrounded by friends and family, the two work through financial difficulties to establish a happy married life. Fastforward about ten years: Ushio is now a teenager. However, Tomoya continues to work the same job. He hasn’t gotten anywhere, as the promotions and chances he felt were coming never materialized. The economy is poor and the job opportunities just aren’t there. Although Nagisa continues to support her husband with love, he spirals into anger and depression. He starts taking out his frustrations by being short with Nagisa and Ushio. 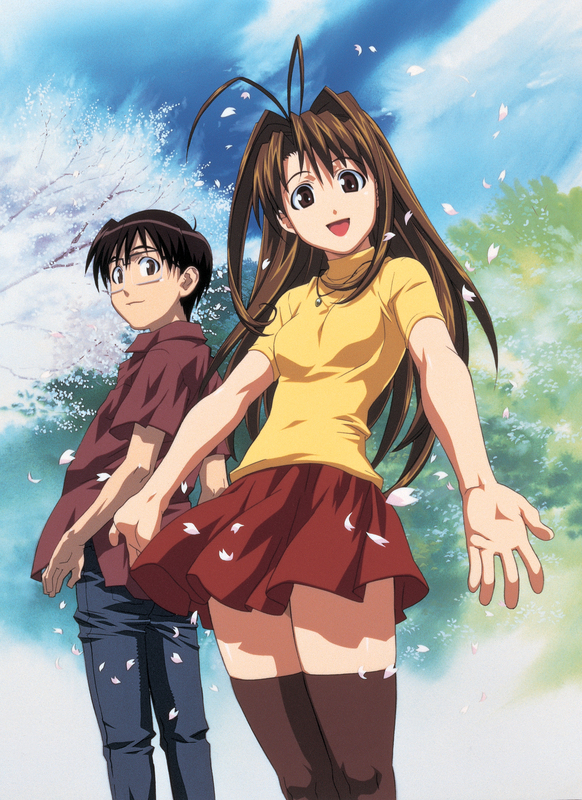 Nagisa decides to return to work to support her husband, and soon does well at her job as a receptionist. But when she gets a promotion to personal assistant to an executive, Tomoya becomes bitter and jealous. Although he hides behind the facade of saying that Nagisa’s boss wants more than her professional services, he really feels angry that he can’t support his family by himself. Two of four. That’s just like it is in the U.S. This wasn’t just an exercise in doing something fun, though it was enjoyable to do. Actually…it was enjoyable, and in a silly way, also heartbreaking. From the beginning, I knew what I wanted to do with Tomoya and Nagisa. 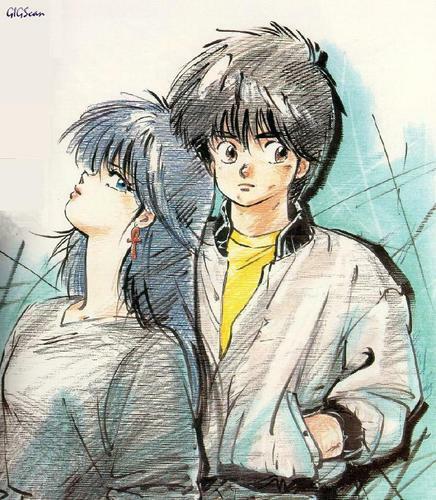 They, to me, are as “meant to be” as any couple in anime. But fairy tales are fairy tales…and life is life. Even “meant to be’s” can end up breaking apart. There are lots of reasons for divorce – some are reasonable, and some are not. “Irreconcilable differences,” unfortunately, often means that the mom and dad will divorce because they don’t want this married life any longer. They don’t want to be with their marriage partner. Selfishness is a rampant disease. When we’re single, it usually effects few others than ourselves. But when we bring this disease into marriage, it effects our spouse and our children immensely. It seems natural and not at all like a disease at first – after all, aren’t we entitled to pursue careers and other interests? Aren’t we allowed to pursue our own happiness, like Tomoya does in my scenario? Unfortunately, children are often seen in practice (if not in name) as just another add-on to a life of happiness. Just add them to the job, possessions, hobbies, friends and financial security. They help make us happy. This is totally the wrong way to live life, but it’s the way many do. So when things get hard, we let go of family as if they’re just a piece of the puzzle, and not the puzzle itself. If children and family are just one component of our lives, we can (albeit painfully) let it go. But if they’re our life itself, like they become for Kyousuke and Madoka, we’ll fight tooth and nail for it. Most of you reading this probably don’t have kids, so I want to tell you: real life with real family is really hard. Most families get to the point (at least once) of divorce, like Ryuji and Taiga did in the scenario. The stress of life and family crushes us at times. So it’s easy to say none of these scenarios will happen to us – but they may and for some of us, they will. But in the end, we make the choice to love. God says that marriage was created to join two people as one. What God has joined together in union isn’t so easy to pull apart – at least it shouldn’t be. If we value family above all other interests – if the end goal of what we do is for family and not for ourselves – we can create a relationship that no man can pull asunder – not even when the one pulling is us. Re: Clannad, that’s way harsh! But it rings of truth, sadly. I must say, I would’ve cried if the Toradora ending turned out badly, XD. It was the only one I read though because I don’t want to be spoiled for those other series, XDD. Interesting post. I can’t say I know what it’s like to have to take care of a family, but I imagine it to be very time consuming. Haha, well, I’m glad I didn’t make you cry! Yes, family life is very time-consuming, stressful and difficult for the parents, particularly when the kids are very young. I think we grow up not realizing how hard it is on parents – it’s one of those things where we think we know about parenting, but we really don’t until we’re there. At least for me it was like that. hahahahaha I can only wish to acquire such a lofty position. In a sense, it’s a miracle that any marriages go the distance, when you think about all the ways they can go wrong. Yeah, I can definitely see it as a miracle. But then again, it’s all about choices. When a marriage is stripped down to the core, it’s about two people choosing to put the other above themselves. That means that pride, temptation and selfishness takes a back door. If these two people can make that choice every day, then a marriage can be successful. This is an oversimplification, but it really does put the ball in the husband’s and wife’s court – love the other person, and every obstacle can be overcome. It cannot be! 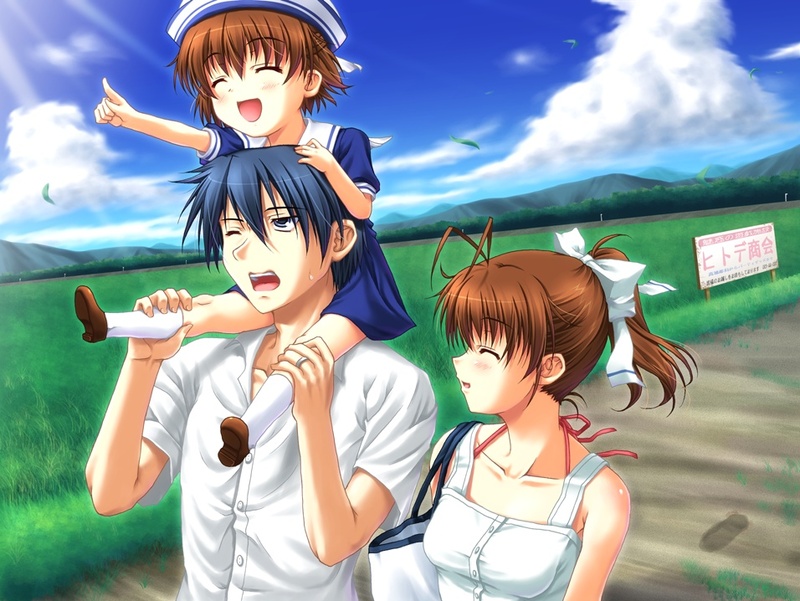 Clannad will always remain in a happy way! I guess it’s really up to the wives and husbands themselves to make each other happy D:. Well, I’m glad that your household is a happy one. That’s becoming rarer and rarer, perhaps. It’s almost always hard for two people, who are of course always very different in many ways, to come together. But like you said, it’s up to the husbands and wives to love each other. Most of you reading this probably don’t have kids, so I want to tell you: real life with real family is really hard. Wow. I’m guessing you have a negative point of on divorce. I think marriage is a personal issue and people have no right commenting on other people’s marriages or divorces, anime or otherwise. I think when we comment on specific marriages (or divorces), we certainly run the risk of being judgmental. When that happens, not only can we hurt others, but we can become self-righteous, which is damages character. I frequently find myself judging celebrity relationships, for instance, and sometimes write a tweet about one that annoys me for whatever reason, before I pull back. I may not tweet the thought, but the thought itself is enough to make me remember that I should be more humble. That lack of grace isn’t very loving. Particularly when someone is going through a divorce, I hope that the church (myself included) can show the individuals going through these difficult times love instead of condemnation. But regarding marriage as an institution, I disagree with you. I believe that marriage is a union created by God that is meant to honor Him. I believe Jesus’ teachings affirm this. And as such, I don’t feel any trepidation is speaking out on behalf of the institution. Whatever. It shouldn’t be an institution. It shouldn’t be a legal public, social issue. It’s personal and private. It’s not an education or career to succeed or fail at. Also to assume marriage is always good for children or divorce is always bad for children is erroneous as well. It is children who are by nature selfish, and it is they who want their parents to stay together because their families are their securities. However marriage or divorce is an adult decision, regardless of how the children feel. The problem with AMerica is that many children rule it, on so many levels. Not a snipe against the current administration. Nor entirely referring to minors. Oh yeah, children are definitely selfish. I have a couple of little ones myself, so I see the principle constantly in practice. But adults are selfish, too. My thoughts are the same now as when I originally wrote this post. I think too many adults put too many things above their children – their own desires and goals. Not all marriages are salvageable and some need to be dissolved precisely FOR the children. But then again, most children will grow up more emotionally healthy if their parents remain together. In these cases, it takes (sometimes a lot of) sacrifice, grace, and selflessness. But in the end, I think it’s worth it for a lot of reasons, and highly among those is for well-being of the kids. Right. I don’t think you know what you’re talking about. I don’t think married people should talk about divorce. They have no right. It’s rude.